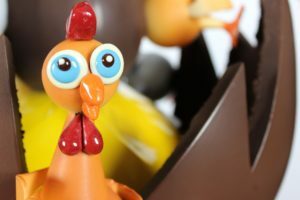 Easter Eggs are specially decorated eggs given out to celebrate the Easter holiday or springtime. It is the influence of the traditional spring rites that made Easter so egg-special. And myths coming down to us from an incredibly distant past have shown man’s relationship with the egg to be very deep seated one. The tradition of Easter Eggs pre-dates Christianity. In many cultures around the world, the egg is a symbol of new life, fertility and rebirth. Caught in old Latin proverb: “Omne vivum ex ovo”. means “all life comes from an egg”. The egg is the symbol of life over all corners of the world. From ancient India to Polynesia, from Iran, Greece, and Phonecia to Latvia, Estonia, and Finland, from Central America to the west coast of South America, there are reports of myths of the whole universe was created from an egg. Thus, it is not unusual that in almost all ancient cultures eggs have been held as an emblem of life. 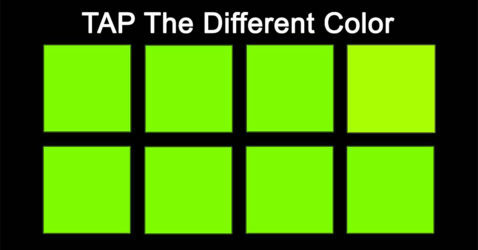 The concept of all living beings born from an egg is also a foundational concept of modern biology. 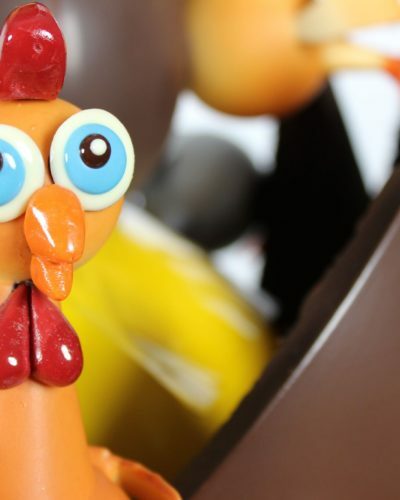 The Easter Egg market is one of the most exciting confectionary markets, with new ranges and presentations attracting more consumers every year. 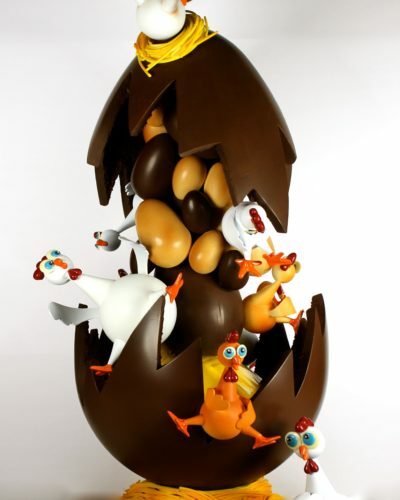 The Chocolate Easter Egg gift market reaches all ages of the population – young and old alike. 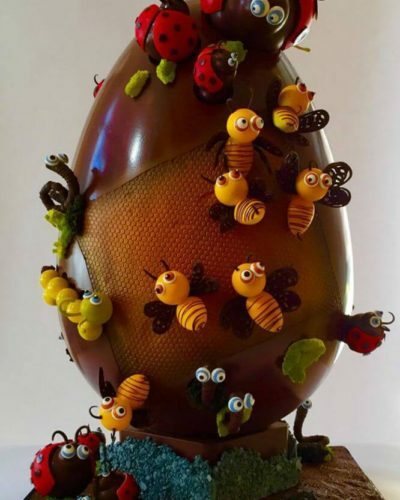 The first chocolate Easter Eggs were made in Europe in the early 19th Century with France and Germany taking the lead in this new artistic confectionery. The modern chocolate Easter egg with its smoothness, shape and flavour owes its progression to the two greatest developments in the history of chocolate – the invention of a the cocoa press and the introduction of a pure cocoa. Sugar and Plumm, The Upper West Side Upscale Chocolatier, has also been written into the chocolate Easter Egg history books. Sugar and Plumm’s Master French Chocolatier, Chef Thierry Atlan (M.O.F.) 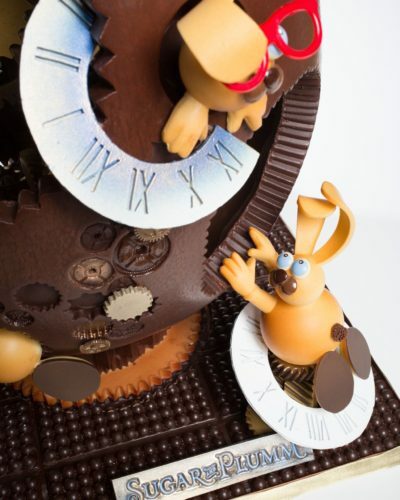 and his team create prodigious, chocolate egg masterpieces to decorate this joyous, spring-time celebration. 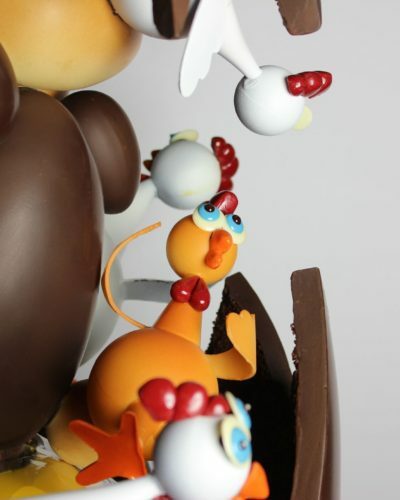 These hand-crafted, animated chocolate showpieces are Sugar and Plumm’s magical rendition of the classic Easter Egg. Every year each egg is enormous and bigger than life. 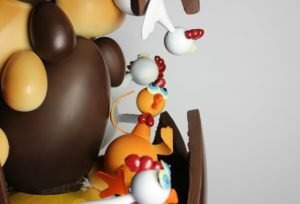 They always portray whimsical characters, playful scenes and elegant themes brought to life on a pure chocolate stage. This years egg-citing cocoa creation evokes a special nostalgia that summons us back to our childhood. A time filled with amazing memories from holidays past. Sugar and Plumm’s Easter Egg symbolizes your inner child’s happy place, a carousel. A carousel that whisked you round and round as the summer breeze tickled your face and butterflies danced in your belly. Sugar and Plumm’s is the first ever motorized chocolate carousel. This chocolate treasure is studded with vintage toys and happy little easter bunnies all playing and riding the carousel. 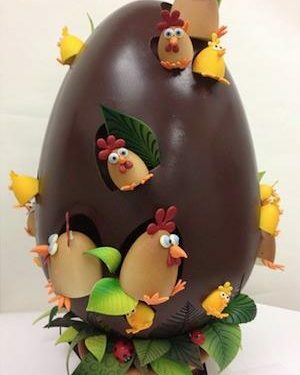 This colossal Easter egg is the epitome of chocolate decadence!. 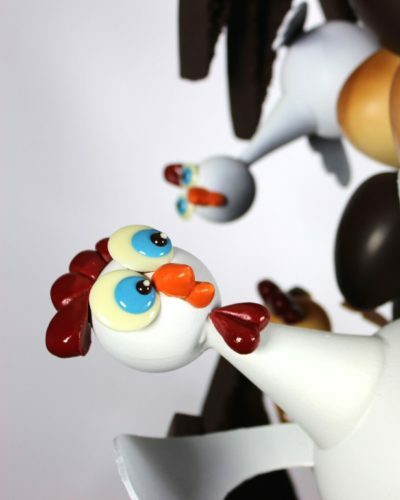 The hand-carved egg stands three-feet tall and is a true testament to the art of chocolatiering. Made from a pure dark Venezuelan chocolate called ‘Criollo’, one could only imagine that this egg would taste as good as it looks. Adorned with colorful birds this sanctuary looks and feels like a scene from the popular, Angry Birds game! 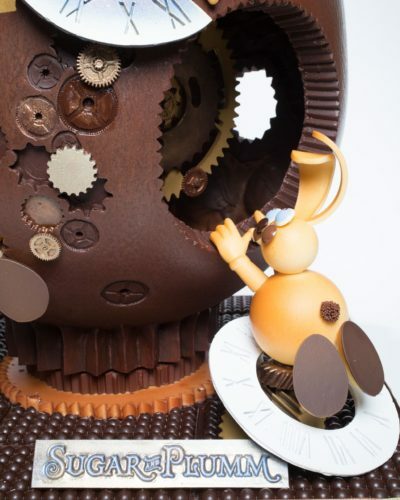 Ever seen a $5,000 Easter egg? 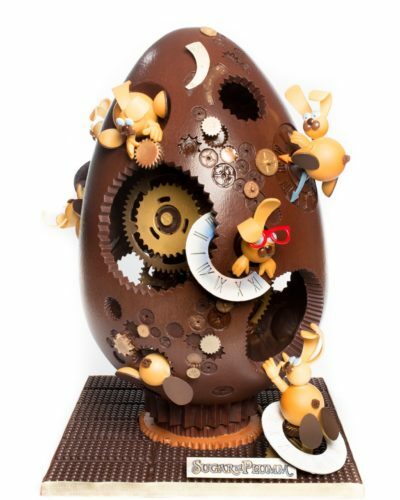 Sugar and Plumm’s egg was painstakingly fabricated by Chef Thierry Atlan and his team of masterful chocolatiers. The crew spent over two weeks creating and hand-painting the intricate egg. 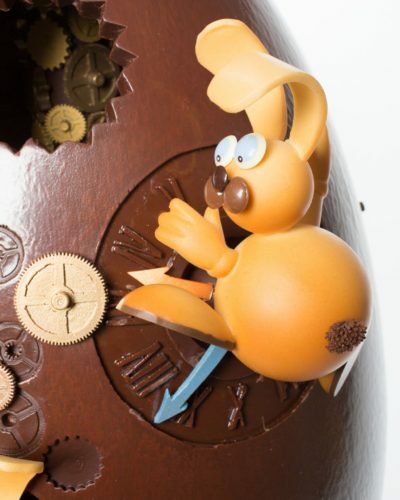 The giant egg stands 30 inches tall and has little rabbit figurines climbing in and out of the chocolate shell. 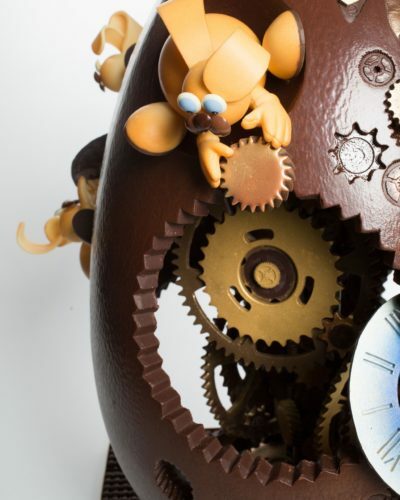 The clock-inspired egg is adorned with gears and clock hands.This 40-pound chocolate monument, is composed of pure white, dark and milk chocolate, all edible, with delicately hand painted 3-D rabbits, clocks and gold detailed designs. Since words cannot describe such these awe-inspiring feats of chocolate we’ve left it to the pictures to tell their story. After gazing upon these chocolate eggs of yore close your eyes and conjure up your own cocoa inspired masterpiece. Who knows Sugar and Plumm may be bringing it to life as we speak.